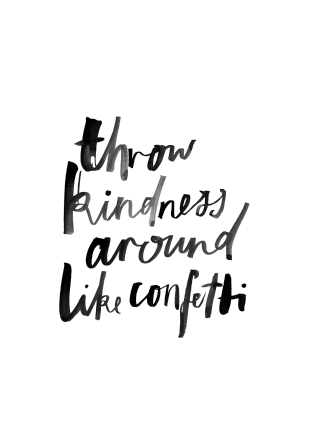 Think Thursday: Throw Kindness Around Like Confetti! I love this black & white digital laser print by Bianca Cash. When I first saw it, I felt a spark (you know…that good vibe feeling) because I value kindness “a whole lot”. It warms my heart to see someone be helpful toward another with no expectations of a return. It’s a contagious but great behaviour to have. When you witness such a pleasant disposition & genuine concern for others and see what the overall impact brings, you will want to experience that for yourself (especially if you were on the receiving end). So why not let go of the selfishness and pay it forward because you want to, not because you have to. That is what I call pure love…Kindness expressed or experienced. Let’s throw kindness around like confetti!. Wouldn’t the world would be a better place?! « Red Carpet: 2014 British Fashion Awards!